The Dakar Rally is known for being one of the most extreme races in the world, but it apparently doesn’t mesh well with extreme weather. After part of Friday’s stage being cut short due to the conditions, organizers scrapped the entire sixth stage of the rally on Saturday when the weather didn’t lighten up. According to Motorsport, a rainstorm in Bolivia shorted the rally’s fifth stage on Friday when it made some of the trails impossible to navigate. 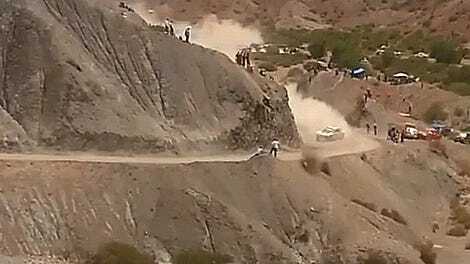 The conditions continued to get worse, and Motorsport reports that rally organizers canceled the sixth stage of the event—nearly 500 miles of racing from Oruro to the Bolivian capital city of La Paz—and gave the competitors a rest day in the capital. Competitors will now take a two-day rest period rather than the one-day period scheduled for Sunday, and Motorsport reports that the rally will resume Monday with the seventh stage of the event. That stage will run between the Bolivian cities of La Paz and Uyuni, covering nearly 400 miles. The entire rally will run 12 stages, finishing up in Argentina’s capital city, Buenos Aires. So, if you were looking for updates on the Dakar leaderboard, the weather is winning. In all seriousness, Peugeot driver Stephane Peterhansel leads the car category, KTM rider Sam Sunderland leads the motorcycles and Iveco driver Gerard de Rooy leads the trucks. But ahead of all of them is the weather, hanging back just enough to delay the competition—kind of like Lewis Hamilton.